Rear View Camera, Remote Keyless Entry, Heated Seats, Cruise Control! More than just a wagon, the 2018 Subaru Outback is an intriguing alternative to a traditional midsized SUV. It has more cargo space than most larger competitors and less thirst for fuel. Functionally, it does everything most midsized SUVs can do and more. This black wagon has an automatic transmission and is powered by a 2.5L H4 16V MPFI DOHC engine. Given that economical motor it gets 9.4 L/100 km in the city and uses just 7.3 L/100 km out on the highway according to Transport Canada. This vehicle's price also includes $7580 in additional equipment, specifically: off road pkg. Our Outback's trim level is 2.5i. This Outback comes with a 6.5 inch infotainment system with built in touchscreen, smartphone integration and STARLINK™ apps and services. You'll also receive a rear view camera and heated front seats for added convenience, Apple CarPlay and Android Auto, air conditioning to keep you cool on hot summer days, cruise control and power windows plus much more. This vehicle has been upgraded with the following features: Rear View Camera, Remote Keyless Entry, Heated Seats, Cruise Control. 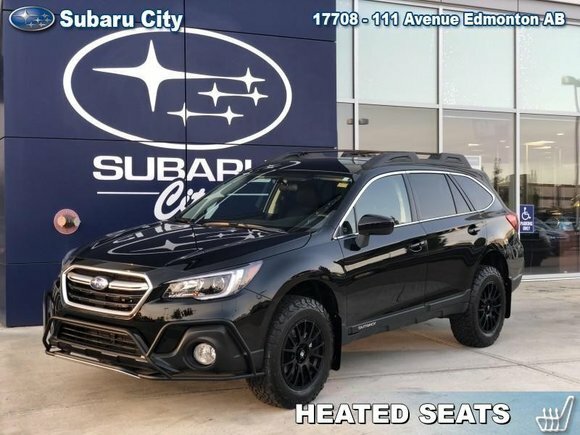 Want to try the 2018 Subaru Outback 2.5i LP Adventure Off Road Pkg?